The flowers by the door of Dream Chef Kitchen aren?t real. But on a dreary day in March, they offered a hopeful note of what might eventually grow. Growth is important to the catering company and restaurant?s owner and chef, Nichelle Benford. She?s done a lot of growing lately. Growing into the kind of woman who wouldn?t stake her future on anyone but herself; the kind of businesswoman who believes she can create space to serve as encouragement to other entrepreneurs eyeing a corner neighbored by empty lots. And growing into the kind of person who believed her story did not end on the 2010 day when she was sentenced to prison. ?That?s always been my dream,? Benford said, ?to have a place where people can come and connect. And I?m seeing it happening, now that we?re open.? On a recent afternoon, people dining in for lunch sat by the windows, chatting and smiling, just as she envisioned. Benford?s menu is a mix of soul food and her experiments from culinary school, like pot roast with mashed potatoes and carrots, served with gravy, or grilled avocado salad, dressed with a refreshing mixture of honey and rice vinegar. But Benford is always thinking bigger. Not only for herself, but also for other women, who might also feel encouraged to start their own business. For the neighborhood, to coax more life from behind storefronts that stand empty. For other people just out of prison. ?I thought my life was over,? she said about being sentenced to jail. Now, she said, ?I?m building a legacy and living in purpose.? Just as she?s taken steps on a path toward rebuilding, she wants to offer that to others. Some of her six employees are recently out of prison, including on a spring day a man washing restaurant windows and a woman cooking salmon and saut?ing vegetables. Benford noticed the woman was good at math, and she began teaching her to calculate food costs. ?I feel like a leader develops other leaders,? Benford said. In 2010, Benford was sentenced to three years in prison on charges of making false statements and obstructing justice. The charge stemmed from Benford lying about where her boyfriend was while he was under investigation in an arson case seven years earlier. Benson acknowledges making a mistake. She was humbled by going from a life where she worked as a model and wore Gucci to one in which someone else decided what she wore and what she ate. In prison, she realized her capabilities to be a leader. She noticed how women listened to her. ?It made me really believe in girl power,? Benford said. ?You don?t realize how strong you are until you go through stuff.? She was released in 2012. Since then she?s nurtured the Dream Chef Kitchen vision. 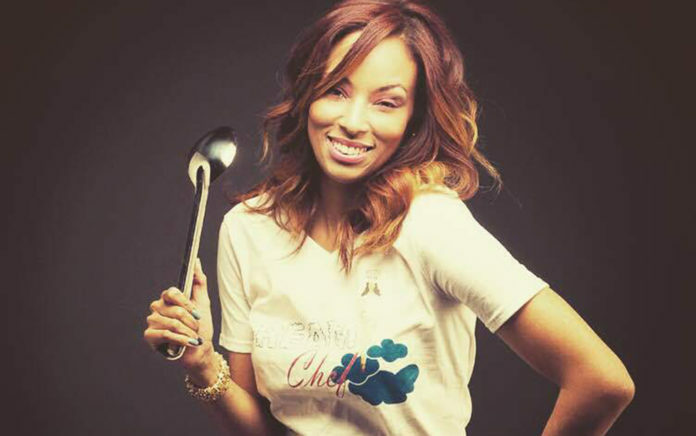 She returned to her food roots, first selling savory crepes from Model Chef, a food truck. Then, she created her catering company. ?I didn?t want it to be regular food,? she said. But Benford wanted space ? she was carrying grills up the three floors to her condo every day. With the help of her former lawyer, Brendan Shiller, she scouted locations, signed a five-year lease and began what became a yearlong renovation. Many times Benford could have stopped. When the plumbing had to be redone, when men talked down to her about plans, when men catcalled her as she parked in front of her business. That time, she yelled back, angrily. But then she collected herself inside her restaurant, and she walked out and introduced herself. ?Talk to me like you?d talk to your mother or sister,? she told them. ?I think a lesser person would have folded up shop by now,? Shiller, Benford?s former lawyer, said. ?What she has is a desire to succeed and a dream and a vision that she wants to fulfill.? From being a first-time business owner to attracting diners in what Shiller calls a ?food desert,? Benford has a lot of support. Launching a restaurant requires resources, so Shiller connected Benford with Chicago Neighborhood Initiatives Micro Finance Group?s micro-lending program. When she chose a neighborhood, Benford needed something she could afford. And she wanted a location like this ? one turn off the highway and about 10 minutes to downtown. ?It?s so convenient,? she said. ?You want to be accessible.? Hopefully, Shiller said, ? (Dream Chef Kitchen) will play a role in helping to revitalize the community without gentrifying the community.? Benford grew up in the Roseland neighborhood, where as a child she remembers options that were mostly fast-food chains. She wants for people what she did not have ? healthy options from a local business. She believes strongly that people should not have to drive to the Loop to get a decent meal, to sit in sunlight by the window, to host a dinner party with friends at tables with fresh flowers. ?Everybody deserves to experience that,? she said. Benford?s catering business provides a financial foundation while the restaurant grows; people can also reserve the space for events. She hopes to eventually bottle and sell her dressings, perhaps open two more Chicago locations. Maybe even a communal kitchen for fledgling chefs. During recent lunch shifts, a steady stream of customers picked up orders to go and a handful of tables were always full ? a group of men in suits sharing lunch, her mother and a childhood friend toasting. Benford knows her customers and their order. ?I remember their name, I remember what they like,? she said. ?I want us to grow with our customers.? Maya Fernandez, who works at the law firm nearby, had brought her lunch to work but came by for a side of sweet potato fries and a smoothie. Previously the only option was the Sharks Fish and Chicken across the street, she said. Having healthy alternatives helps. And, she added, ?It?s flavorful.? On a spring afternoon, Benford?s mother, Rene Armstrong, was in town, drinking Champagne to celebrate her daughter?s new restaurant. She and a childhood friend ordered pot roast and collard greens, one of Benford?s favorite dishes. Armstrong said she was proud but unsurprised that Benford built this life after prison. Her daughter has always been a hard worker, she said. And she is certainly not surprised she is a chef. Armstrong recalls when her daughter was a toddler who loved watching her grandmother cook. One time, she entered the kitchen to hear the little girl casually ask, ?Where?s the nutmeg?? ?She?s been doing this for a very long time,? Armstrong said.